The Combaula site is part of the Australian Pacific LNG’s gas processing facilities project. The plants will be processing the raw natural gas from the gas fields for delivery to domestic and global market. The site is located approximately 45km north of Yuleba, Southwest Queensland. 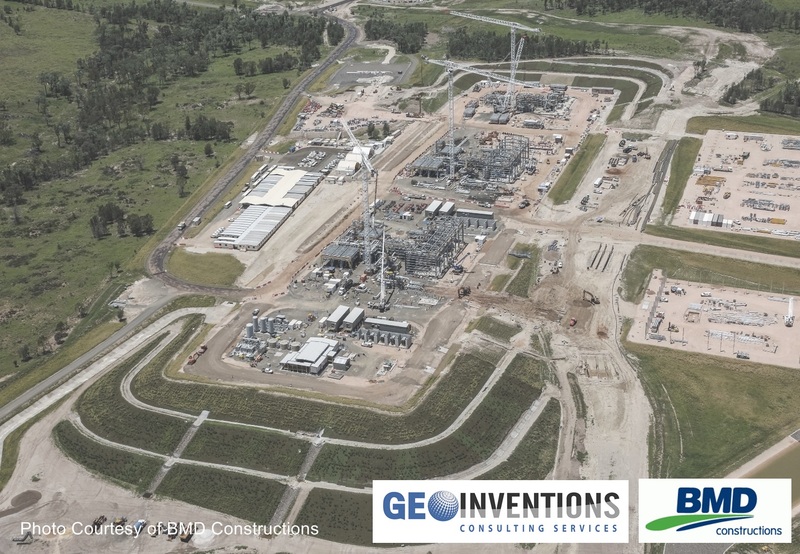 Geoinventions Consulting Services Pty Ltd (GCS) were contacted by BMD Constructions with an intention to review the current internal road pavement designs for the Combabula Gas Processing Facility. This is the primary access road linking Horse Creek Road to the Gas Plant Facility for the APLNG development area. GCS conducted several geogrid reinforced pavement designs in accordance with the AASHTO Guide for Design of Pavement Structures 1993. This design concept was adopted in localised “soft spot” areas to improve subgrade strength. GCS also reviewed current geotechnical information, conducted new on-site tests and established a new geotechnical data set for the pavement design optimisation. The geotechnical data set comprises of longitudinal soil profiles, CBR long section profiles and an Atterberg Limit test result summary chart. GCS conducted a thorough review of the laboratory test results, reinterpreted the CBR strengths and categorised the subgrade into four subgrade strengths. This optimised the pavement design by allowing the client to construct different pavement types depending on four subgrade strengths. Further geotechnical investigations by GCS qualified geotechnical engineer and field testings to validate the reinterpreted CBR strength. Utilise onsite material for pavement design which provided significant material savings and reduced the overall construction timeframe. This resulted in significant cost savings of more than $1 million dollars and reduced the construction timeframe on internal roads considerably.